I am in my late 30s, and I have awesome hearing. Always have. I credit this to a few things: I was a quiet and shy kid, quiet and shy teenager, and then studied audiology for a few semesters in college while still staying quiet and shy. This particular professor made his lessons quite memorable, and I’ve never forgotten his warnings when it came to protecting your hearing. See, unlike a good number of health issues, damaged hearing is, for the most part, irreversible. In the past, hearing loss was typically something the average person didn’t have to worry about until their golden years. However, today, 1 in 5 teens has some form of hearing loss. This number is about 30% higher than it was in the 80s and 90s, and many experts believe the increased use of headphones among the younger generations is partially to blame. Remember that rockin’ Dokken concert you attended in the 9th grade? (And no, I’ve never been to a Dokken concert; I just like to rhyme.) When the sound waves entered your ear, the eardrums vibrated. These vibrations were then carried to the inner ear, where fluid directed them to rows of hair cells. Through these hair cells, your auditory nerve fibers were stimulated, which then sent impulses via your auditory nerve to your brain. The hearing process was completed as your brain interpreted the impulses as music. Music that was too loud…but you probably ignored that message from your brain, right? 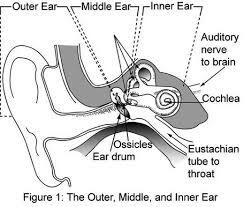 That very loud music, and loud noises in general, as well as even chronic exposure to sounds that are not ear-splittingly loud, damages those inner ear hair cells, causing them to become disarranged and to degenerate. Once the hair cells are damaged or dead, they cannot be replaced. We are born with a fixed number of them, and when they go, so does our auditory sensitivity. The first to go is typically our sensitivity to high-frequency sounds, followed by the frequencies of speech. Perhaps not vitally important when you’re 90 years old, but devastating to a young child or teenager. An Australian study has indicated that 70% of children are at an increased risk of hearing loss due to the use of personal listening devices. Young children are at a disadvantage with their shorter and less-developed ear canals, which can cause them to suffer greater damage from loud music or toys. However, despite the risk, researchers at Boston Children’s Hospital have determined that it is relatively safe to listen to a portable device with headphones as long as the 60/60 rule is in place: Set the volume to no more than 60% of its max and listen for no more than 60 minutes. Use headphones that sit outside the ear, as opposed to ear buds which don’t allow any noise to escape. 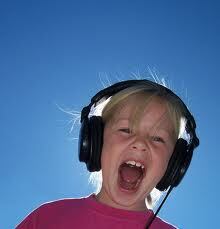 If you can hear what’s coming through your child’s headphones…and you don’t have them on…then it’s too loud! Enforce listening breaks. Remember the 60-minute recommendation. You set the volume on your child’s device. Check whether the device has a maximum volume limit setting. Purchase kid-safe headphones, which have lower maximum volume levels and a better fit for smaller ears. Educate your kids on the dangers of noise-induced hearing loss and enforce the limits you set for safe headphone usage. In my house, when something is too loud, you’ll hear the cries of “You’re blowing out my eardrums!” Even the 3-year-old is aware of what’s too loud for her ears. Just like we caution our children against starting at the sun or sitting nose-to-screen with the TV because of the dangers involved, so, too, do we need to stress the importance of safe listening. Just be sure to do it, though, when their headphones are off!